After buying our fifth wheel trailer in April (see our post, The Beast and The Fox) and then equipping it, we were finally ready to hit the road in May. May turned out to be Oregon-month for us as we traveled from the mountains of northeastern Oregon down the magnificent Columbia River Gorge and then on to the Pacific coast. We started off the first week of May in the pretty La Grande Valley below the Wallowa Mountains of northeastern Oregon. We set up in a quiet little state park outside of tiny Union Oregon; Catherine Creek State Park; a bargain at $10/night, but without electrical power or sewer hookups – water only, and no cellular signals this far up in the canyons. No matter, we set up our generator for power, could use the nearby bathrooms and their flush toilets, and the camping spots were widely spaced apart under the shade of tall Ponderosa Pine trees. Better yet, this early in the year we had the place to ourselves except for the campground hosts at the other end of the park. Winter in the La Grande Valley was lingering on; one day sunny, snowing the next. We stayed there for a week. One day we drove up to Baker City in the high plains above La Grande. We stopped at the Bureau of Land Management’s Oregon Trail Museum and then drove out to the historic gold mining town of Sumpter where a massive gold dredge and other historic mining equipment were preserved. It snowed most of the day, but it was fun to visit these historic places without the droves of tourists that would soon be showing up in June. Another day we toured the Northwood Manufacturing factory where our trailer was built and found it fascinating. Tours are free and given Tuesday through Thursday – just show up at 11:00, no reservations needed. The rest of the days were filled with shopping for last minute items we needed, exploring tiny but tidy Union Oregon where we used the local library’s WiFi to take care of some business, or just lounging at Catherine Creek. We found the best restaurant in the valley at Union’s Rexall drug store complete with a 1950’s soda fountain and homemade rhubarb pie. But, we got tired of the cold and snow and finally moved on to visit friends in Hood River Oregon in the heart of the Columbia River Gorge. The huge Columbia River flows south out of Canada until the Washington State/Oregon border. There it makes an abrupt turn westward to flow on to the Pacific Ocean. On its westward run the river has carved out a spectacular gorge through the Cascade Mountains. These mountains form a rain shadow that catch the rains blowing in off the Pacific on their western flanks while the eastern side is left much drier. So, driving through the mountains inside the massive Columbia River Gorge you pass from the dry “eastside” of treeless sage brush plains into the lush Douglas Fir forests of the wet “westside” in a surprisingly short distance. It’s one of the quickest transitions between major ecological areas in the world. Hood River is situated in the middle of this transition zone and we were welcomed there by old friends, Chuck and Aleris. They live above town in the midst of an apple orchard below the glaciers of 11,000 foot high Mount Hood. We set up our trailer next to their house and immediately appreciated the hot, sunny days; a refreshing change for us after the cold and snow of northeastern Oregon. Hood River is the self-proclaimed wind surfing capital of the world where the near-constant winds blowing up the Columbia River whip waves up on the wide river, and there were hundreds of kites skimming across the water. Hood River is situated between two massive, glacier-covered volcanoes; graceful 11,000 foot-high Mount Hood to the south and the rounded peak of 12,000 foot-high Mount Adams to the north in Washington State. They were both spectacular, blinding white in their fresh winter snows. Hood River itself is a pleasant little “river town” and we spent a day walking around it, watching the wind surfers at Waterfront Park. But we ate at home with Chuck and Aleris who fed us locally gathered and home-raised meals; razor clams they’d dug at the coast or fresh eggs from the chickens they raised. By the time we left we were badly spoiled. We drove up to famous Timberline Lodge on the flanks of Mount Hood; the only place I know of in the conterminous United States where you can ski all year round. The lodge was built in the 1930s under Franklin Roosevelt’s Work Projects Administration; a program developed to bring the U.S. out of the Great Depression, and it was impressive. The building is massive centered on a gigantic, two-story fireplace with small bars and restaurants radiating out from it; all overlooking Mount Hood looming above with skiers sliding down its flanks. Throughout are hand carved wood panels, hand woven tapestries and hand wrought metal work all produced by the artisans that built the lodge eighty years ago. We spent another beautiful sunny day riding our bikes from Hood River through the “Mosier Tunnels” route of the Columbia River Hike and Bike trail; a fifty-mile long paved route above the river and over the shoulder of the mountains that form the Columbia River Gorge. This has to be one of the most spectacular bicycle trails in the world. Another day we drove to the base of Mount Adams outside of the quirky town of White Salmon and explored the ice caves; a unique area in the forest where rain water drips into a lava tube (a cave formed in hardened lava) and then freezes to make fantastic ice formations inside. The ice lasts all year and early pioneers used to “mine” the ice, hauling it by horse and wagon to Hood River. After five-days of fun in the sun we left our friends for the Pacific coast to begin our slow migration down the coast of Oregon and on into California. We started at Astoria Oregon where the Columbia River pours into the Pacific Ocean. We set our trailer up in Fort Stevens State Park; a quiet place set in the Sitka Spruce forests along the cold, sandy beaches of the Pacific. Typical of Oregon state parks it cost $32/night with full hookups (water, power and sewer), cellular signals are weak here. This is the place where the early explorers, Lewis and Clark, reached the Pacific coast during their epic journey from St Louis across the country in 1805. 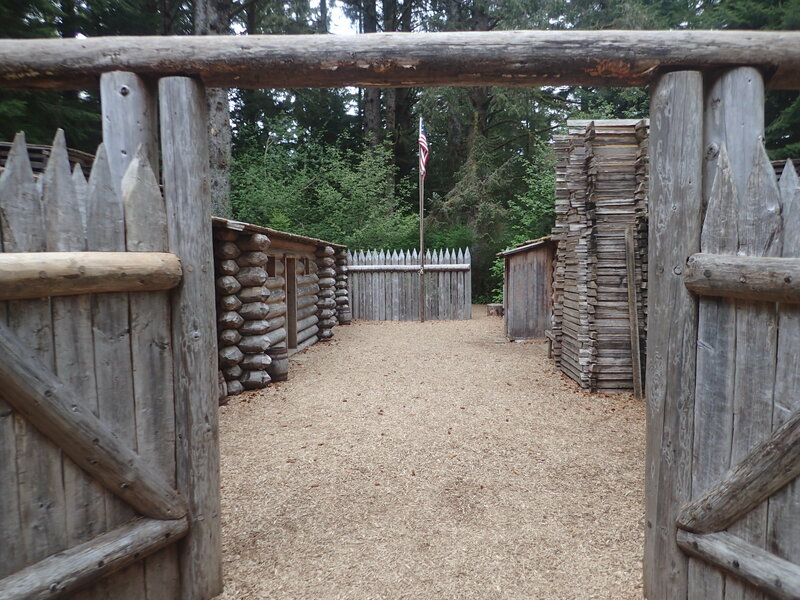 We toured Fort Clatsop National Historic Park where they spent a rainy winter before walking and canoeing all the way back to Washington DC to report to then president Thomas Jefferson about the wonders of the west. Astoria itself is a small maritime city; the port of entry for freighters bound for Portland Oregon up the Columbia River and ships were anchored offshore waiting their turn to steam upriver. We spent an afternoon at the small but excellent Maritime Museum that described the dangers of navigating across the infamous Columbia Bar at the mouth of the river; considered the most dangerous shipping passage in the world. We spent another morning walking around the mossy, Victorian neighborhoods of Astoria and driving across the interstate bridge to Cape Disappointment State Park in Washington to see the lighthouse near Ilwaco. We rewarded ourselves with an excellent meal of fried oysters and local porter beer at the Wet Dog Saloon in Astoria before returning to our camp and riding out to the beach on our bikes to catch the sunset over the Pacific. The perpetual mist and clouds of winter had moved out and the coast was bathed in the bright sun of early summer. It was a great start for our coastal journey, but it was now late May and the Memorial Day holiday was fast approaching marking the beginning of the busy summer travel season. 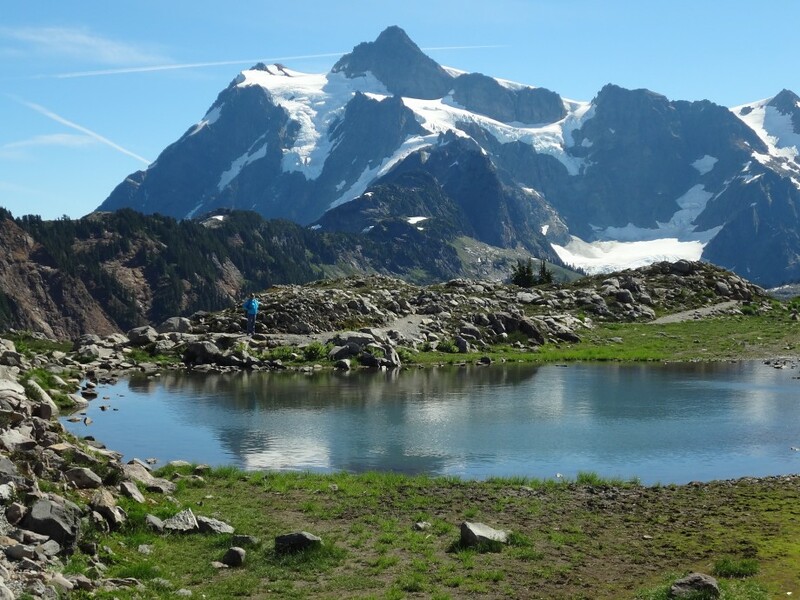 We had gotten used to just showing up at parks or campgrounds and having them almost to ourselves and the start of summer season took us by surprise. 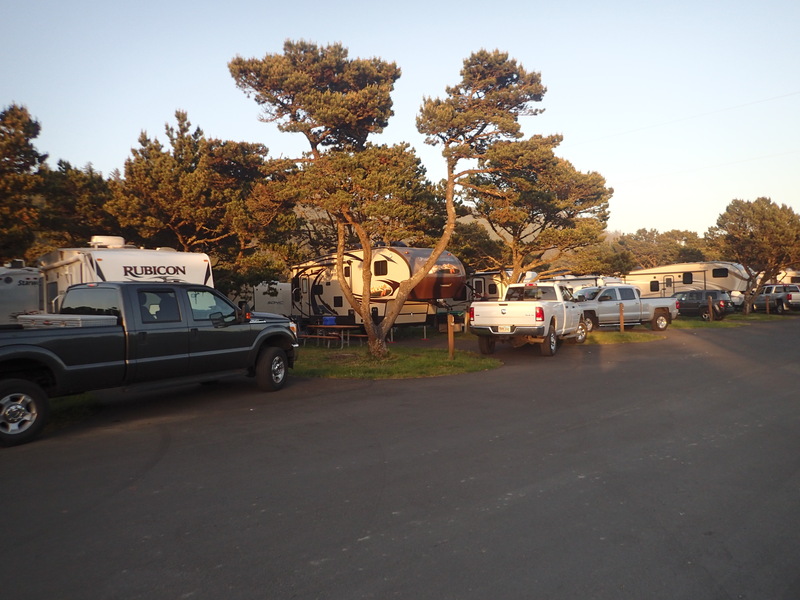 We were already finding state parks and other campgrounds fully reserved over the upcoming holiday weekend including Fort Stevens where we were staying, so we had to find somewhere to stay and find it fast. Luckily, we found a county-operated RV park outside of Tillamook Oregon that had just received a cancellation. Just an hour’s drive down the coast from Astoria, Barview Jetty County RV Park provided full hookups (electricity, water and sewer) at $36/night and we immediately reserved four nights there. Internet service was an additional $4/day, but cellular service was reasonably good so we used our cell phone to connect to the internet via our personal WiFi hotspot. We were lucky, but we still paid the price for our lack of planning. When we arrived, the park was mobbed with hundreds of RVs packed in side by side. Our neighbor arrived and promptly unloaded a keg of beer and an industrial size barbecue grill. As evening fell a choking cloud of campfire smoke and noise drove us inside of our trailer. This was not our vision for traveling and we promised each other to plan better and “boondock” more (camping in primitive areas on public lands such as in national forests). Even so we made the most of it. We spent our days away from the noisy park to explore this dramatic part of the Oregon coast. We drove around the Three Capes Scenic Loop from Tillamook to land’s-end at Point Meares with its iconic lighthouse and watched a pair of bald eagles raiding the nests of roosting cormorants on the cliffs far below. Another foggy morning we hiked out to Cape Lookout, one of the most dramatic points on the coast and ate oysters and clams harvested from the bay that morning. But, when it came time to leave, we were glad to go. June had arrived and we had plans to stay with old friends, Dave and Su, at their house in the forest far up a river above tiny Yachats Oregon along one of the most beautiful parts of the Oregon Coast. But first we would boondock near the Drift Creek Wilderness Area in the Siuslaw National Forest. Then, after visiting Dave and Su, we’ll continue down the Oregon coast towards California. But, we aren’t there yet so check out our next report when we continue the journey.